Home / Le blog / In Niort Face Boogie, here we go ! In Niort Face Boogie, here we go ! “No boogie-woogie before making your evening prayers” says Eddy Mitchell’s song. But from May 14th to May 17th in Niort, Boogie will rather be deeply advised ! No Eddy Mitchell on the horizon. But Domitille Kiger, Philippe Vallaud, Vincent Cotte, Nitro… These names do not tell you anything ? No panic, I explain to you. Boogie is parachutists' gathering. And the names which I have just quoted you, they are personalities of parachuting world. 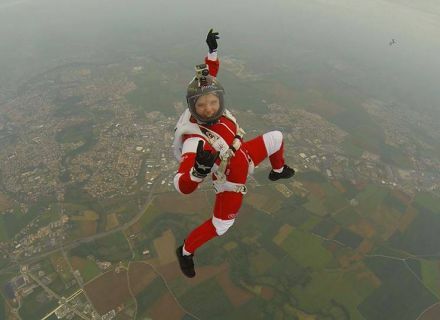 Domitille Kiger for example, is a world champion of parachuting in Freefly ! Classy eh ? Boogie is a good opportunity for the parachutists to do group jumps thanks to 2 Pilatus who will allow to do jumps for 5000 meters. 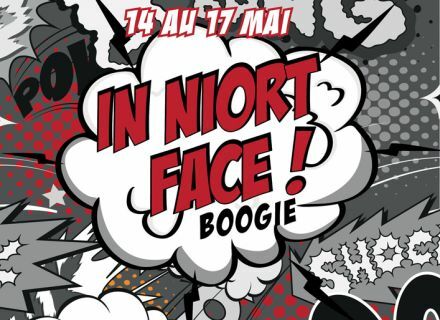 At the origin of this Boogie "In Niort Face" ? The team of Démenciel Parachutisme, which bend over backwards to organize an awesome weekend ! Throughout the weekend, from 9:00 am to the sunset, the public can come to admire the sky niortais under his most beautiful colors. Throughout the days, jumps will be executed with loadmasters. Once arrived at the ground, the parachutists will spread their exploits on the big screens. 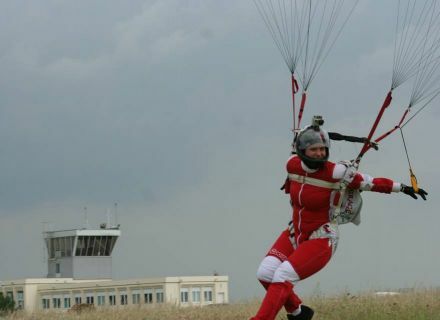 Thus the public can meet the parachutists. If you are interested, it will be possible to sign for a discovery jump or why not, a training to learn jump in autonomy ! But now, let us hand over to our world champion Domitille Kiger, who makes us the honor of her presence for this Boogie niortais. Why to participate in Boogie ? Domitille Kiger : A boogie is the perfect opportunity to strengthen, to acquire new skills, while sharing a beautiful moment of sport and cohesion. The center of Niort, by calling on foreign coaches, expose its members to new influences, and attract parachutists of the other horizons. 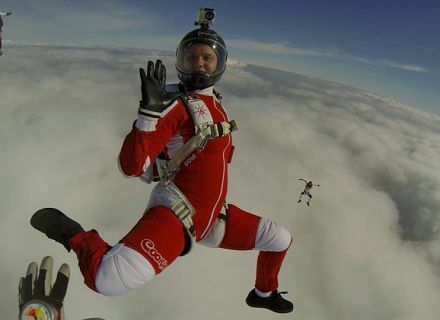 You are a world champion of parachuting in Freefly. How takes place the championship ? 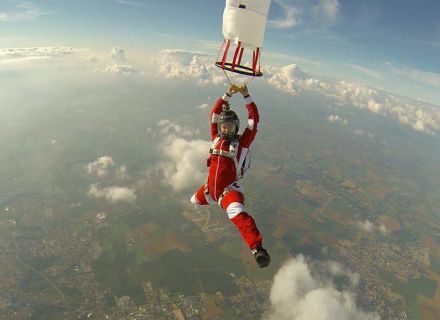 Domitille Kiger : A world championship of freefly takes place in 7 rounds (7 jumps). It is an artistic discipline of the sports parachuting, and as the figure skating for example, the rounds divide up between jumps of free, and jumps of imposed. 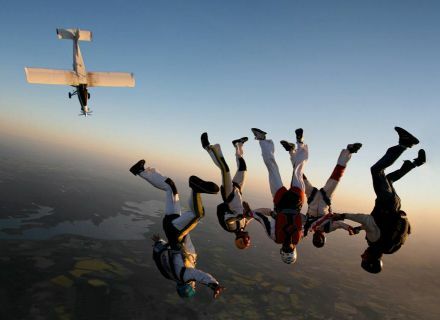 A team consists of 3 parachutists : 2 performers and a videoman. The videoman is an integral part of the team, and it is the images which he brings back to the ground who will allow the judges to estimate the performance. His flight thus has to accompany and emphasize the jump of the performers, by flying all around, above and below them. The team has 45 seconds from the exit of the plane to realize the most creative, most technical, most innovative and most beautiful jump, by demonstrating its capacity to be stolen in all the orientations : upside down or head at the top, in an angle, moving in orbit horizontal or vertical, in high speeds. On the imposed jumps, all the teams have to integrate 4 obligatory movements into their jump. It is not the first time you jump in Niort. What pleases you in Niort and in the region ? Domitille Kiger : It will be the third time I jump in Niort. Cris and Nedge, the managers of the new structure exploiting the paraclub, Démenciel Parachutisme, are old friends and it is thanks to them that I discovered the region. I like the family and friendly atmosphere of the paraclub, as well as the very professional infrastructure. The region is beautiful to overfly, and I was always welcomed with open arms. My secret weak point for the region ? Your oysters !!! After two last months in Russia, in Mexico, in every corner of the United States, in Australia and in Spain, I am delighted to do a French stage in Niort ! Photo credits : Démenciel Parachutisme.